Global climate change is a natural process that currently appears to be strongly influenced by human activities, which increase atmospheric concentrations of greenhouse gases (GHG). Agriculture contributes about 20% of the world’s global radiation forcing from carbon dioxide, methane and nitrous oxide, and produces 50% of the methane and 70% of the nitrous oxide of the human-induced emission. 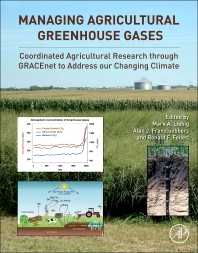 Managing Agricultural Greenhouse Gases synthesizes the wealth of information generated from the GRACEnet (Greenhouse gas Reduction through Agricultural Carbon Enhancement network) effort with contributors from a variety of backgrounds, and reports findings with important international applications. Cropland Management in the Eastern U.S. Climate and Soils of the Eastern U.S.
Chapter 9. Cropland Management Contributions to Greenhouse Gas Flux: Central and Eastern U.S. Soil, Climate, and Agricultural Characteristics of Eastern and Central U.S. Performance of Mitigation Options in Eastern and Central U.S.
Chapter 11. Greenhouse Gas Flux from Managed Grasslands in the U.S.